Daylight Saving Time is here, which means your clocks sprang forward. Is it time for your savings to spring forward too? Dividend rates on Term Certificates are increasing. You can more easily reach your savings goals by opening a Term Certificate, such as an 18-Month Bump Up Certificate with an APY* of 2.43% as of March 5th. To review all our current rates for Term Certificates, click here. A Term Certificate earns a higher dividend rate than the other savings accounts, such as our Tiered Savings account. What If Rates Go Up After I Open a Term Certificate? If the offered dividend rates for new certificates go up again in the next few months, you don’t have to miss out. One advantage of the 18-Month Bump Up Term Certificate is flexibility; if rates increase in the future, you can raise your dividend rate to match the new rate, once per the 18-month term. *APY for 18-Month Bump Up Term Certificates as of March 5th, 2019. Rates are subject to change at any time. Term Certificates = Minimum deposit of $250 required. Additional requirements may apply for Business Memberships; please contact us for further details. APY is the effective annual rate of return and assumes that the funds will remain in the deposit account for a full 365 days. Transfers from external accounts are limited to $10,000 per day and $50,000 per month. Funds may not be immediately available. If you have any questions or need current rate information on your accounts, please call 415.674.4800 or 1.888.499.FIRE (3473) from 7AM to 8PM (Pacific) Monday – Saturday. Every year, tax bills can be a significant source of stress. SF Fire Credit Union is here to help if you need to finance a tax payment. The Tax Loan is generally available at a rate 2% lower than a standard 36-month Signature Loan*. The loan proceeds must be payable to a Tax Collection entity, such as the IRS. To apply for a Tax Loan, please submit an application through Online (Desktop) Banking, visit us in the branch, or call our Contact Center at 888.499.FIRE (3473). *APR =Annual Percentage Rate. All Personal Signature Loans are subject to credit approval. The actual rate will be based on credit-worthiness. The maximum aggregate unsecured credit limit is $50,000 per member. Payment example: A $5,000 loan at 9.24% APR for 36 months has a monthly payment of $159.51. Other terms & rates available. And just like that, we’ve flown through the holidays and into a new year. I hope that you have all enjoyed a relaxing holiday season with family and friends. In looking back at 2018, I see a year that has been a challenging journey for our credit union. We have invested time, energy, and resources in updating our online platform and internal processes, significantly expanded our Contact Center, and worked to improve our member service. While I wish I could say we have achieved all we set out to accomplish, the truth is we aren’t quite there yet. Some of the improvements we promised you haven’t yet happened. And some of the long-term changes we have been focused on have produced unexpected short-term service problems for our members. You deserve, and should expect, excellent service from your credit union every day on the phone, online, and in person. I’ll be the first to admit that hasn’t always been the case over the past year. But I am proud of the progress and resilience I have seen from our team. Your credit union is evolving for the better every single day. The seeds we have planted in 2018 with internal changes and new approaches will blossom in 2019, bringing you a credit union with stronger service, better products, and the long-term security to maintain our tradition of member and community service. I have also been inspired by the support we have seen from our members over the course of the year. You have demonstrated your commitment to this credit union time and again, from our annual meeting in February, through a summer of firehouse visits and activities, to joining us in supporting the SF Firefighter Toy Program during the holidays. In short, our credit union is financially sound, our membership is dedicated, and our team is stronger than ever. The stage is set for a great year. I look forward to sharing it with you. The family of the late Steven Pacatte would like to extend their thanks to the members of the credit union for their contributions to their family during this difficult time. Did you catch a Santa Sighting this year? 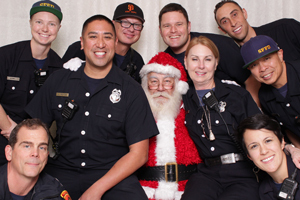 As ever, Santa Claus (retired SFFD Firefighter Bob Cuff) provided a highlight of the holiday season for SF Fire Credit Union, visiting the branches to pose for photos with members, staff, and firefighters. Thank you to Stations 1, 10, 15, and 19 for joining in the fun. 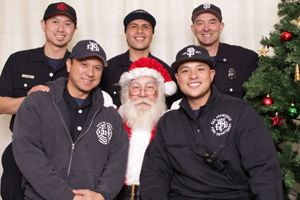 Santa dropped by to help support the hard work of the SF Firefighters Toy Program, and our members responded with donated toys in the toy barrels and cash in the donation jars. On December 11th, not only did Santa visit the California St Branch, but also SF Fire Credit Union staff baked delicious holiday treats for our annual Employee Bake Sale (all proceeds benefitting the Toy Program). Thanks to our members, we raised almost $500 for the Toy Program. We would like to thank our members, who really stepped up with toy donations this year. Our branches collected ten barrels of toys for the Toy Program. Your generosity makes a big difference in the lives of children.